The media tablet marketplace got a little bit more crowded today when Amazon unveiled its Kindle Fire tablet at a press junket in New York City. The Kindle Fire will feature a 7-inch touchscreen, 8GB of storage, dual core processor and sell for $199, considerably less than recently announced Android tablets from Acer, Asus, Motorola, Samsung, Sony and Toshiba. The Fire tablet offers Wi-Fi connectivity, but no 3G. In a nod to keep the cost of the tablet so much cheaper than its competitors, it has less flash storage, and lacks a camera and microphone, features found in most rival tablets. The tablet will go on sale November 15 and consumers can start pre-ordering today. In addition to the Fire, Amazon also introduced a $79 Kindle eReader, a $99 touch-screen e-reader called Kindle Touch and the Kind Touch 3G for $149. The eReaders will go on-sale in November. 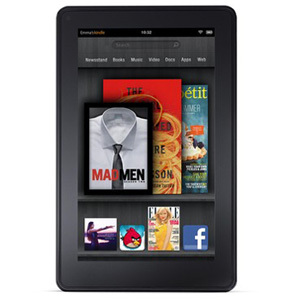 Discuss Amazon’s new tablet in Digital Home’s Smartphone and Tablet computing forum.